"Professional Online Educator-Faculty - Preparation for Excellence in Online Teaching"
Here is some info. 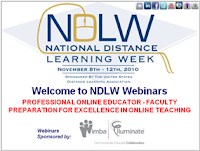 on one of the NDLW webinars sponsored by USDLA. 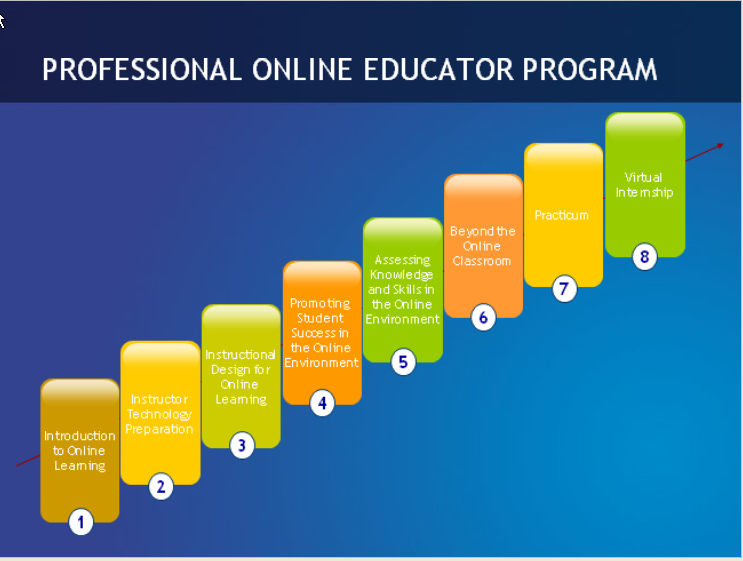 The webinar featured Pearson's online professional development program to prepare educators to teach online. At Bb World, I had gotten information on their professional development courses and they sent me information about their course development process, but I haven't had a chance to follow-up with them so I was glad to see that they were doing this webinar. Research indicates, and our A`o Kumu Program validates, that teachers want more online prof. development opportunities and more of them are wanting to learn how to teach either hybrid or online courses. The presenters reiterated the fact that as a 21st century educator, to not learn how to teach online is detrimental to both your practice and to the impact you can make on the students you teach. It's no longer an option or a choice or something that "those" teachers do. The presenters also stressed the fact that online teaching, however is not something that can be instantly transferred and that it takes training to be able to take the content, methods and strategies used in a f-2-f class and apply them effectively in an online environment. Pearson went on to preview how they are helping schools and organizations meet this need/challenge through a seven level educator training program that includes everything from pedagogy to instructional design to a culminating practicum experience. 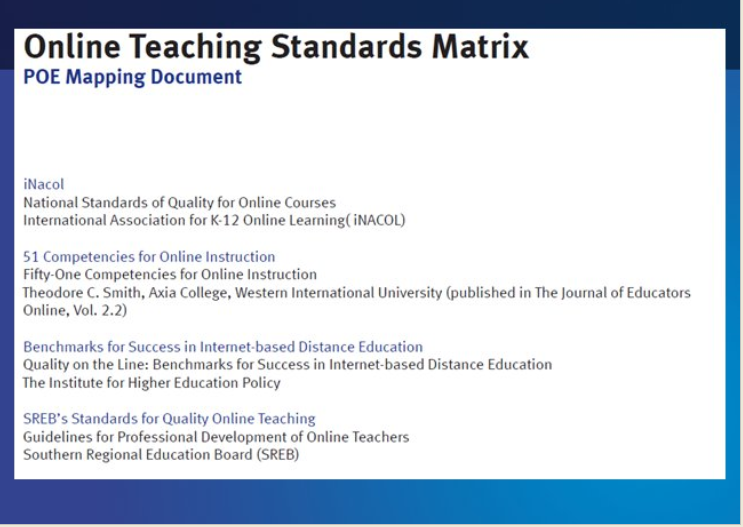 They design their courses and have them reviewed by a group of faculty advocates who work at all levels and positions in distance learning using a set of standards that include iNACOL and SREB. The schools or organizations provide their own instructors and Pearson can customize the courses/programs to a certain extent to meet their organization's needs.